I never anticipated being quite so enthralled by the sight of a man vacuuming a spotless floor. It’s not just what he’s wearing – a white coverall with a hood – but the whole room around him. There’s nothing here in the way of interior décor – the worlds largest clean room is all function. Nestled inside the NASA Goddard Space Centre, High Bay is 1.3 million cubic feet of impeccably pristine space. 9,000 square feet of HEPA filters make up an entire wall, through which some one million cubic feet of air is circulated every minute. All this so no dust will settle on the enormous golden hexagons parked on a two storey platform mere feet away from the window of the observation room. To many astronomy buffs, the chance to see the James Webb Space Telescope (JWST) being built would be deeply thrilling stuff. For astrophysicist Dr.Tilak Hewagama, this is simply where he goes to work. Named after the father of modern rocket propulsion in the United States, the NASA Goddard Space Centre in Maryland isn’t the easiest place to get to, but Tilak makes the trip every other day from his home in Silver Springs. Even the most determined visitors seldom make it past the visitor centre and into the buildings beyond. To do so, I’ve had to apply for security clearance weeks in advance as well as complete courses on IT security and undergo GSFC-Hazard Communication Training online. However, I’m now a designated science collaborator and ridiculously pleased about it. Not least because of this opportunity to get up close and personal with JWST, hailed as the scientific successor to the venerable, much beloved Hubble Space Telescope. With 72-foot long sunshield the size of a tennis court and a 21-foot mirror, JWST is due to launch in 2018, says Tilak, pointing to the models of the telescope displayed in the waiting area. 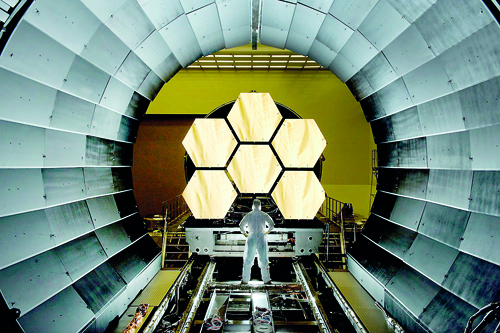 He notes that JWST’s mirrors get their distinctive look from a thin covering of gold, which is itself protected by another layer of glass, optimising the instrument for infrared light. Seven times more powerful than the Hubble Space Telescope, this instrument will allow us to look back 13 billion years to see the ‘first light’ of the universe. Stationed 1.5 million kilometres away from our planet, poised at one of the five Lagrangian points, it will be a giant; the largest space telescope ever launched. It’s a pity, we won’t be there to see it deploy. Delivered all folded up like an origami artwork in a payload capsule of an Ariane 5 heavy-lift rocket, JWST will unfurl gracefully out of its metal cocoon. (It’s why NASA hiring the voice of Optimus Prime to narrate one of their promotional videos was an inspired choice.) Its fuel storage capacity is expected to allow it to function for only a decade but it might be even less considering its many, unique operational challenges. For instance the side which faces the sun will reach temperatures of 85°C while the section which houses the mirrors and scientific instruments will be a freezing-233°C. Needless to say, lots of things could go wrong. In recent months, NASA has created teams that are dreaming about how best to use the time they have with the telescope. 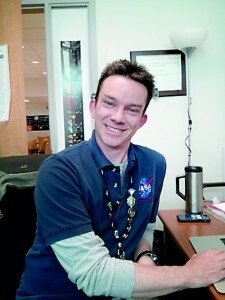 Scientist Conor Nixon is the head of the group that’s making the case for a moon. He’s an old hand here at Goddard where’s he’s worked for over 14 years on the flagship Cassini-Huygens programme. The spacecraft, whose spectacular images of Saturn have shown us the planet in all its incredible beauty, has also allowed us to explore not just the gas giant itself but the extraordinary system of rings and moons that circle it. For his part, Conor has long been interested in one moon in particular. low gravity and just the right surface pressure mean that if someone strapped a pair of well-constructed wings onto you, you could, in theory at least, fly. Conor seems much more intrigued by the possibility that they could find the precursors of life while digging around there. “Some people think Titan is similar to the prebiotic Earth long ago, when the molecules were forming the basis of life,” he says. What would we find if we sent back even more sophisticated spacecraft? Now, with anticipation rising for the Webb’s launch, Cassini is scheduled to meet a grisly, if magnificent end sometime in 2017.One can’t help but feel a pang for the faithful spacecraft which sent us those images of lightning storms on Jupiter, the plumes of liquid water erupting out of the surface of the moon Enceladus, and that awe-inspiring image of Earth as seen from Saturn. It has shown us such unimaginable beauty. But Cassini still has more to offer. Published in the Sunday Times, Sri Lanka on 22 June, 2014. Words by Smriti Daniel.